First off, off, a confession. These are not the ones I made. Mine did not have the dollop of brownie batter on top, though I sifted a skiff of dark cocoa powder over each of them. All fifty-six of the little darlings have been devoured. Before I made them, I planned to photograph the process and the finished product, but as it was late at night, and I was feeling my way through the production, I forgot. This morning I planned to take photos before bringing the cupcakes to a party, my friend dropped in on her way to same party and, always easily distracted, I forgot again. And then they were gone, though not before I gave a couple of them a quick taste test. They passed, by the way, though it was necessary to taste two of them to be sure. I do like to be thorough. The chocolate brownie base requires a fudge brownie mix plus whatever oil and eggs are listed in the package directions. Note, I mean just the oil and eggs, not the water or any other fluid. Mix the boxed mix with your oil and eggs to achieve a soft dough. If it is too stiff, add a few drops of water, being careful not to let it get too wet. Spray each cup in a mini muffin tin with vegetable oil, then place a teaspoon of brownie dough into each, gently pressing a small depression in each with your thumb. In a small bowl, use your electric mixer to beat together two 4-ounce packages of cream cheese, two thirds cup of granulated sugar, two eggs and two teaspoons of vanilla extract. 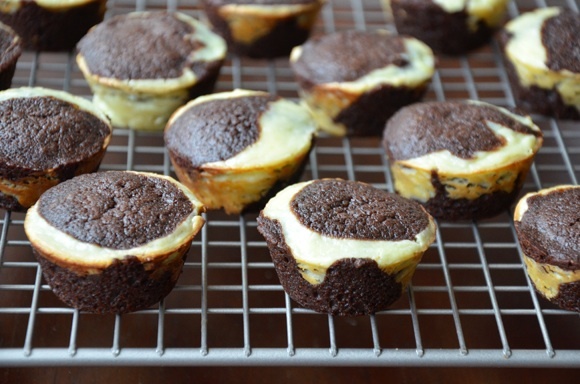 Spoon this mixture into each brownie cup so the muffin tin is three-quarters full. Now you can lightly sift cocoa powder over each, or drop a couple of chocolate chips into each, or both. Then bake at 350 Fahrenheit for 15-20 minutes, until a light touch does not break the surface of the cheese mixture. Let cool ten minutes before gently loosening the sides with a sharp knife and removing the cupcakes to a rack to finish cooling. This recipe, as noted above, makes fifty-six mini cupcakes. If you have not the need for so many, or the freezer space for them, or if you only want to make half the recipe, just use half the brownie mix, halving all other ingredients as well. Then all you have to do is enjoy. Oh, and revel in the praises of all who taste them, if you are willing to share.